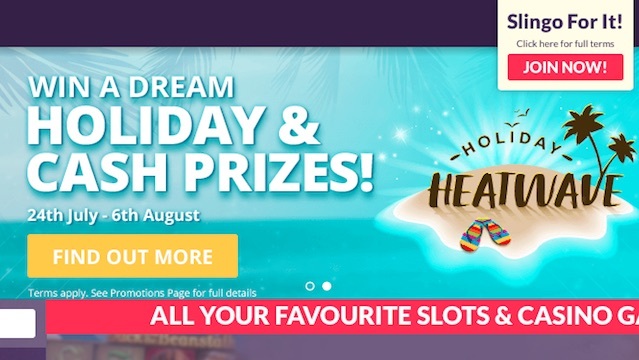 This July and August at Slingo.com play for the chance to win a dream holiday in Costa Rica or Mexico, and £1,000 in cash prizes daily in their fabulous Slingo Holiday Heatwave Promotion. This amazing promotion runs from Monday July 24th to Sunday 6th August, with one holiday to be won in each week. 1. Sign up with Slingo.com. 2. Deposit £10 or more. 3. Start playing on ANY game on the site – every £10 you wager will get you another entry into that week’s draw. On Monday 31st July the draw will take place for the prize of a holiday for two in Mexico, staying in a 4* hotel in Cancun. The lucky winnners will also get to swim with Whale Sharks and head out on a Crocodile Adventure Tour. The draw for the second week’s prize will take place on Monday 7th August. The winner will be given a 7 night holiday for two in Costa Rica, including accommodation in San Jose and a 3 night tour of the Monte Verde Cloud Forest. There will also be daily prize draws with prizes of free spins, bonus cash and real cash, with up to £1,000 real cash at the top level for VIP winners. Non-Vips can win up to £500 each day. vThis spectacular prize draw is available to new and existing customers of Slingo.com. Don’t miss out, sign up your new account today and you will also be eligible a welcome bonus of for 50 Free Spins – No Deposit needed – exclusive to Offersville.com. Slingo Casino is one of the best mobile casinos in the UK. They have a fabulous selection of games, including their very own unique Slingo game formats, like the recently released Slingo Rainbow Riches and Slingo Showdown.